If there's anything I've learned to cook well over the past couple years, it's biscuits! Now that I have my signature buttermilk biscuit recipe down, I've had fun experimenting with various flavors and add-ins. Given the season, pumpkin biscuits were a must. I recently read an article questioning if the pumpkin spice craze had finally run its course. I refuse to listen to the Debbie Downers this fall though. While I can admit that the vast array of processed pumpkin spiced foods are exhausting at this point, please don't miss out on the goodness in something homemade, especially with a fresh pumpkin spice blend. Biscuits are definitely no exception. 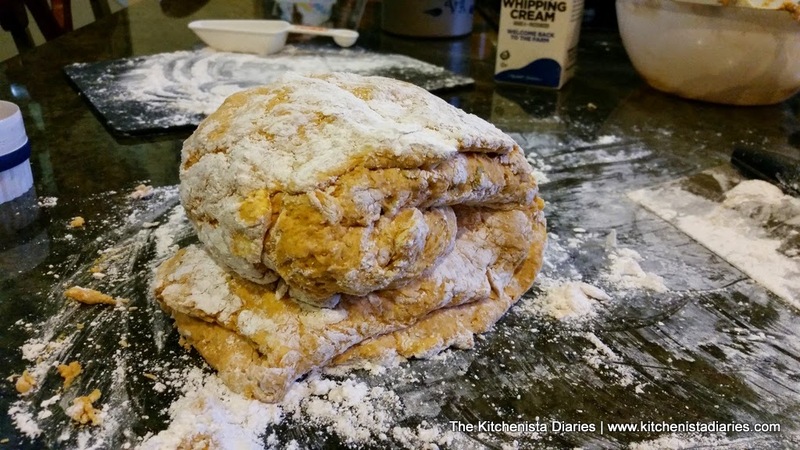 There is absolutely nothing - nothing - that compares to homemade biscuits from scratch. My Perfect Buttermilk Biscuits tutorial is the best place to start if you'd like to learn all the ins and outs to making a great biscuit. This recipe builds on that version, with a few tweaks to the technique that work with the additional ingredients. 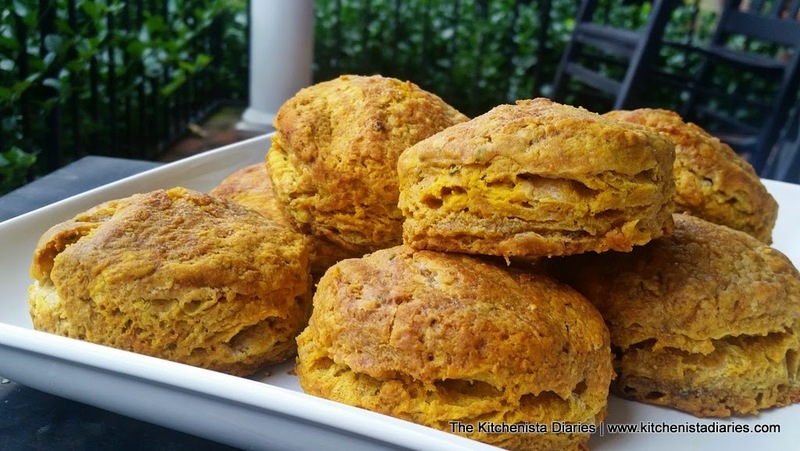 These Pumpkin Sage Biscuits are tender and flaky with the flavor of pumpkin front and center. Complimenting the pumpkin is the comforting warmth of pumpkin pie spice, sage, and a hint of maple. I learned from my Pumpkin Pancakes recipe that canned pumpkin is your best bet here; fresh pumpkin was just too inconsistent for my tastes and yielded mildly flavored biscuits. I don't know about you, but when I eat something that's pumpkin flavored, I want to see and taste the pumpkin. Just keep it easy and stick to the can for best results. 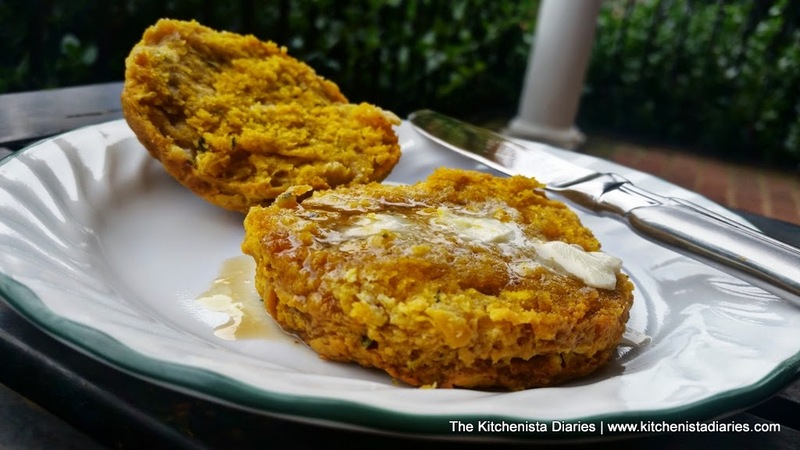 I also scaled my recipe up to use the entire can of pumpkin, so it makes a double batch. This led me to experiment with freezing extra unbaked biscuits and I'm thrilled to report it works wonderfully. Those instructions are included below! 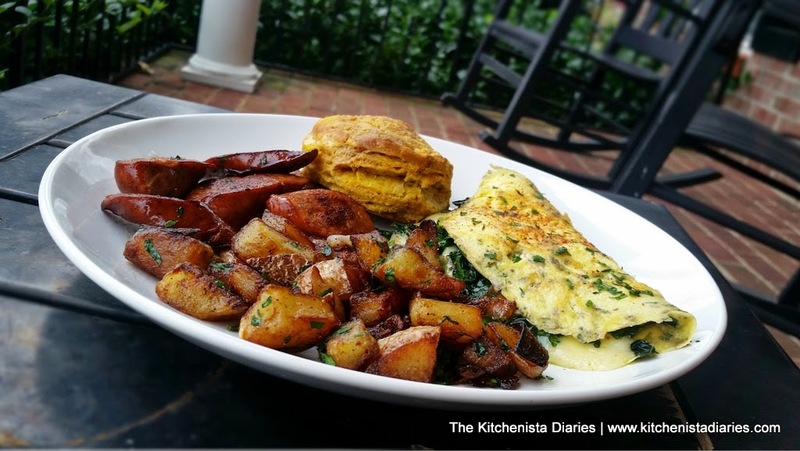 We enjoyed today's batch of biscuits as part of a delicious brunch - pan fried chorizo, duck fat home fries and a kale & Fontina omelette. It was some heavenly fall cooking. Don't you just love this time of year? *See notes on substitutions, below. A quick note about the ingredients: As indicated above, a blend of half cake flour and half regular AP flour can be subbed for the White Lily, which is a lighter flour and usually only available in the south. I've also included an Amazon link above if you'd like to purchase it (and you should!) For the buttermilk, unfortunately where I live now I have only been able to get my hands on low fat buttermilk. For this reason, I use half heavy whipping cream to add back some of the fat that's essential for good biscuits. If you're able to get full fat buttermilk, feel free to use that solely. Regarding the butter, my preference for baking is European butter, and recently I've started to prefer salted butter for my biscuits and pie dough. If you want to use unsalted, just add an extra pinch of salt to your dry ingredients before mixing. I don't typically use up my good European butter for the couple tablespoons that I melt though - regular butter is fine for that! Finally, maple sugar is a cool new ingredient I've been working with this fall. It's stronger in flavor than white sugar and healthier for you than refined sugars, with the added bonus of a concentrated maple flavor. I've been using it when I want the flavor of maple but not the liquid component. Light brown sugar is perfectly fine to use here if you don't want to add a specialty ingredient to your shopping list though! 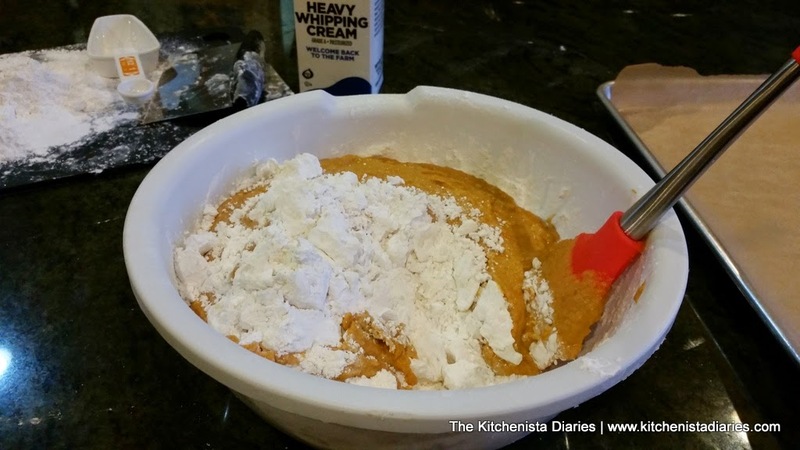 Mix together the canned pumpkin, buttermilk, heavy cream, maple sugar, pumpkin pie spice, black pepper and salt. Taste test to make sure it's adequately seasoned. 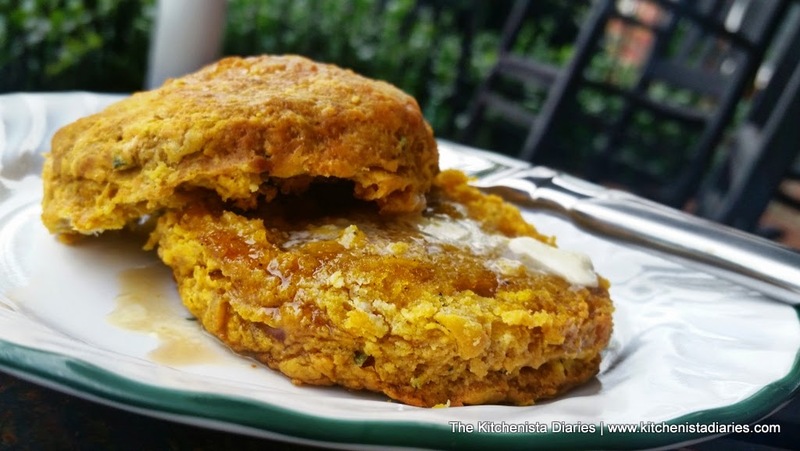 You're not looking for a sweet pumpkin biscuit, but you do want to have the right balance of spices and salt to enhance the flavor. 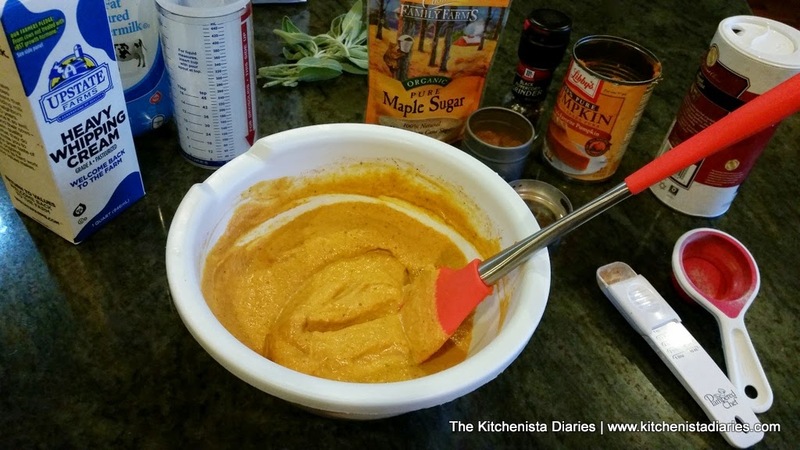 Transfer the blended pumpkin puree to the fridge so it can chill for a few minutes. 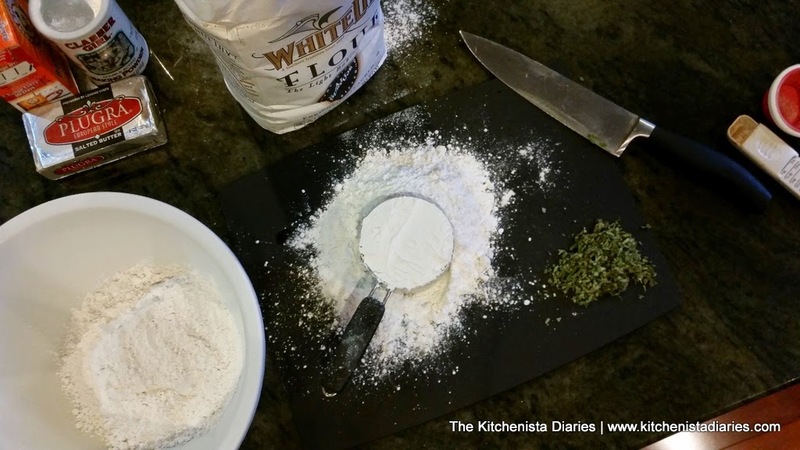 Measure out your flour properly for the best results. 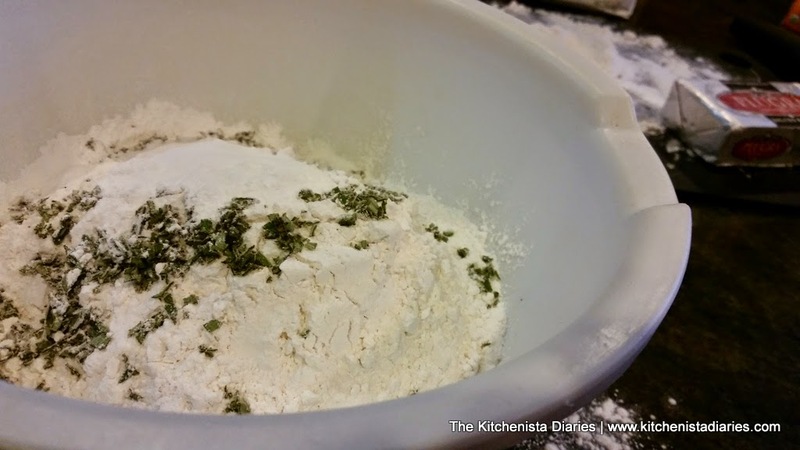 Stir up the flour in your bag, then spoon it into your measuring cup and level off. 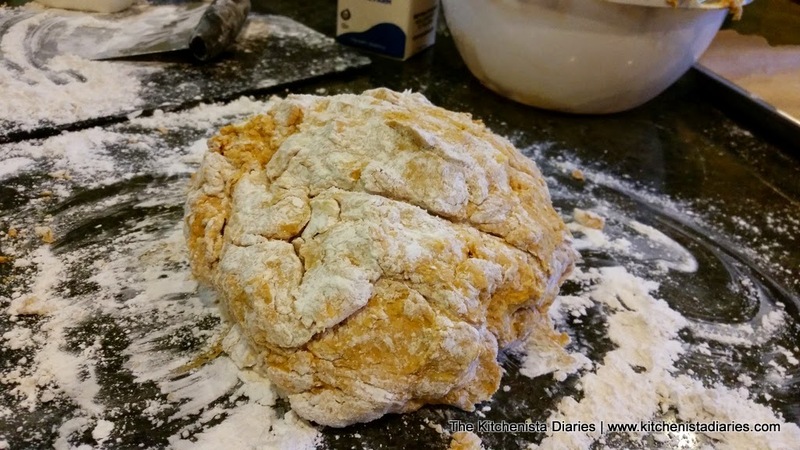 Reserve the extra flour to use for flouring your work surface later. 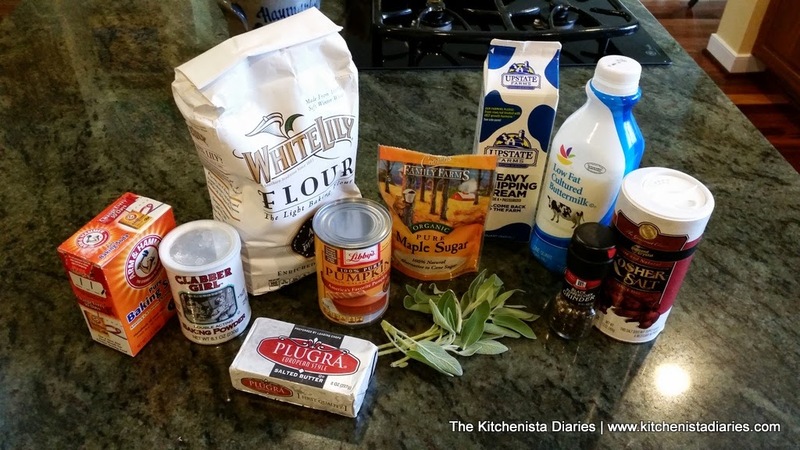 Whisk together the flour, baking powder, baking soda and chopped sage. Use a knife or the blade of your dough scraper to thinly slice the frozen European butter and incorporate the butter into the flour. Whether you use your hands or a pastry cutter, you want to end up with large flat flakes of butter throughout the flour. Press any larger chunks between your fingers to flatten them out. 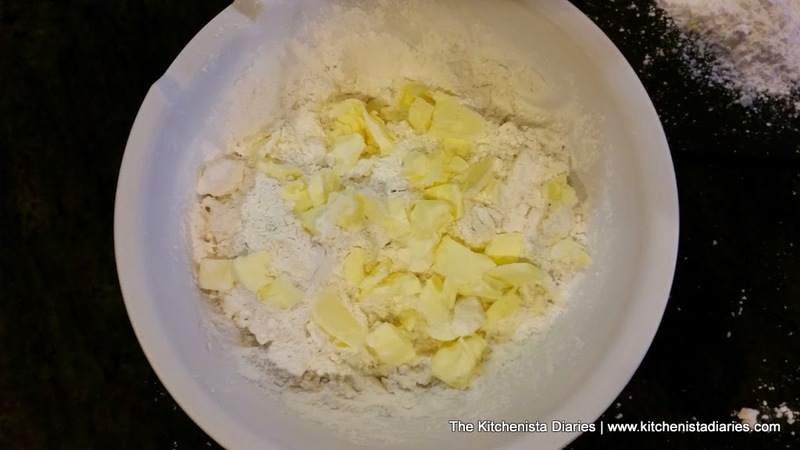 Please feel free to refer to my original tutorial for buttermilk biscuits for more examples of how to cut in butter if you've never done this before! I like to transfer my bowl to the freezer for a few minutes at this point to make sure the butter stays solid, so I just use that time to clean up a little before proceeding. At this time I'll preheat the oven to 450° F and line a heavy baking sheet with parchment paper. It's a slightly cooler oven than I use for my standard biscuit baking, but I felt that it worked better with the sugar content of the biscuits to prevent scorching. 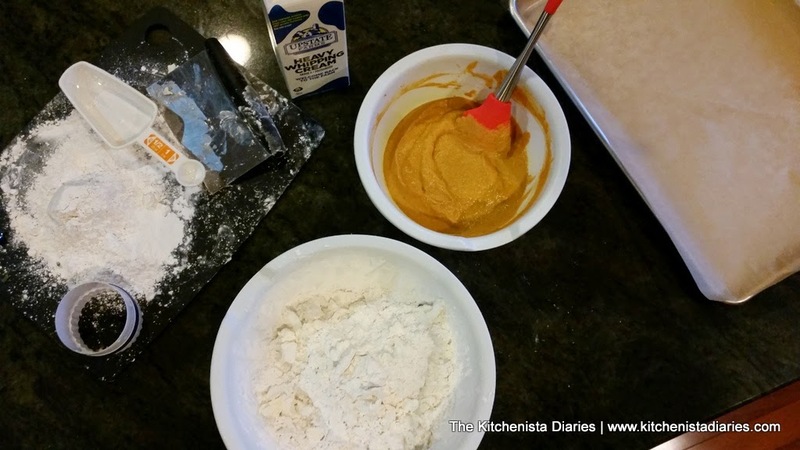 When you're ready, gently incorporate the wet pumpkin mixture into the flour/butter. A silicone spatula is the easiest tool for this. If it's too dry you can add a splash or two of cream. The mixture will probably be slightly wet and sticky, which is fine - you'll be incorporating a little more flour into it for the next step. 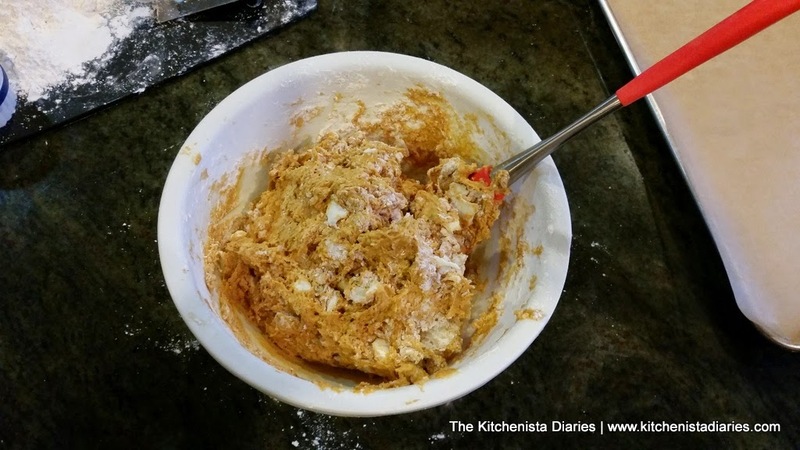 You just want to get it so it forms a loose dough; don't overmix or you'll end up with tough biscuits. Turn the dough out onto a floured surface and gently gather it together with floured hands just until you have a soft, workable dough. 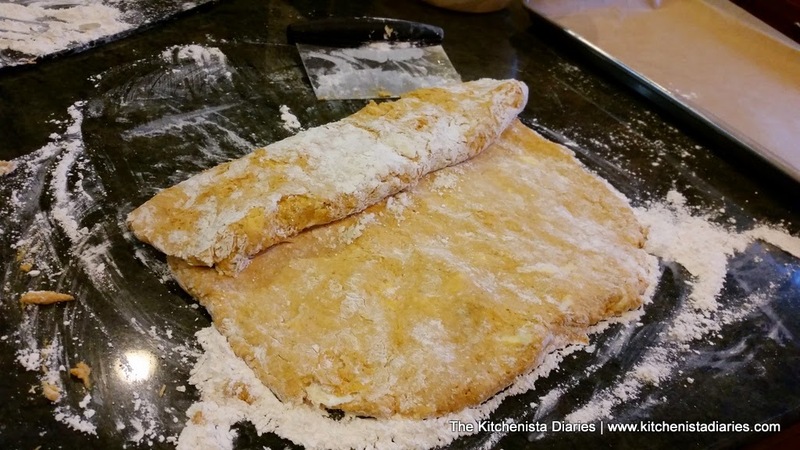 As you work the extra flour into it, it'll be a little less sticky but it should still feel soft to the touch. 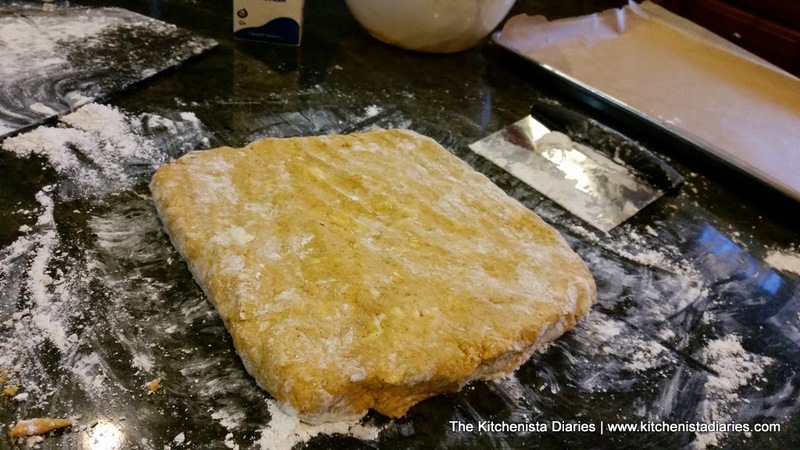 Pat the biscuit dough out into a huge square, about half an inch thick or so. 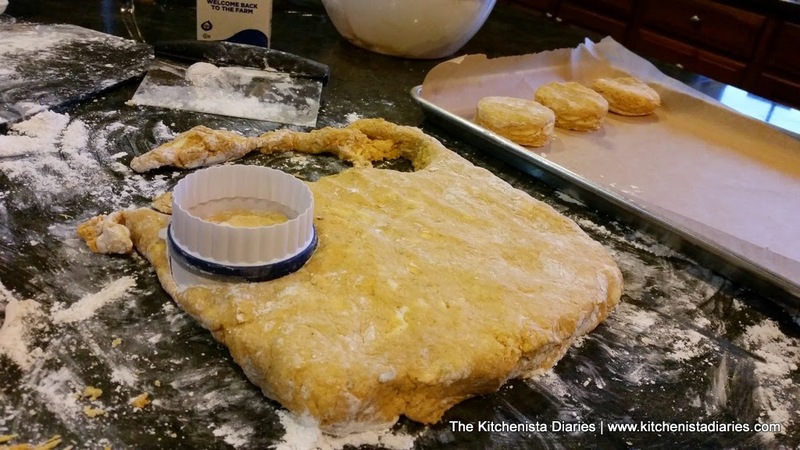 Using your dough scraper to help lift, roll or fold the biscuit dough onto itself. Keep going until it forms somewhat of a log. This is helping to create the layers in your biscuit. Fold that onto itself one or two more times so it's stacked up into even more layers. And now flatten it out, using your hands to press it back into a thick rectangle. A little thicker than an inch will give you good size biscuits. 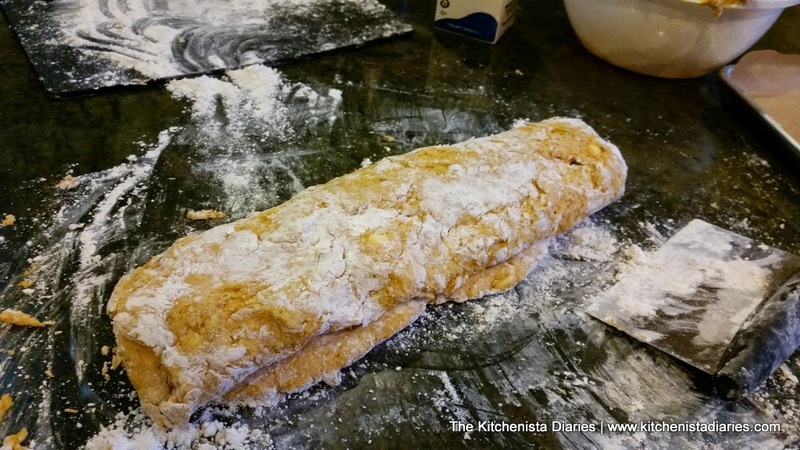 You don't want it to be too floury at this point, so brush any excess flour off the surface. Using a floured biscuit cutter, press straight up and down to cut out and release the biscuits. 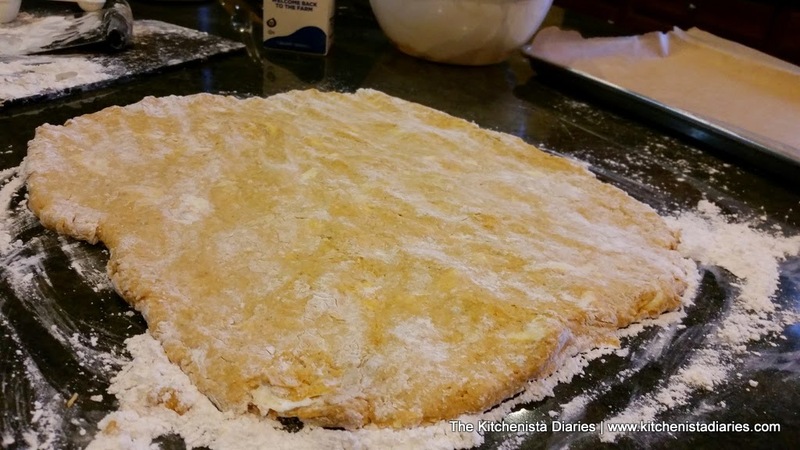 Cut them as close together as you can so that you get the most out of the dough before you have to use scraps. I get about 9 this way, then I gather the scraps together and press it out again to cut the remaining biscuits. The second round usually doesn't make biscuits as "pretty" as the first, but they'll taste just as good. You should be able to get about 16 medium sized biscuits when all is said and done. 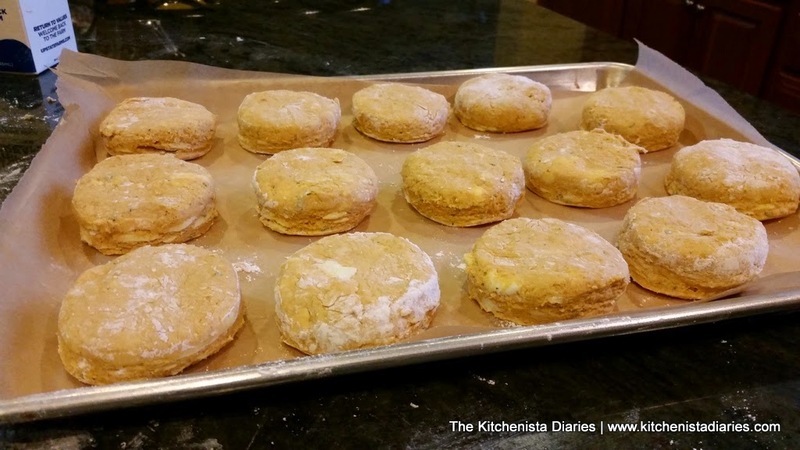 Arrange them on the parchment lined baking sheet with an inch or two between if you like biscuits with crusty sides. If you like soft sides, it's okay to arrange them so they are touching. That's a personal preference! If your butter is starting to melt at all, it's best to pop the whole baking sheet into the freezer to allow everything to firm up again before baking. You want the butter to melt in the oven, as it's the steam rising from the butter that helps push up the layers of the biscuits. As I mentioned above, it's also possible to stop here and freeze the biscuits so you can bake them at a later time. Just arrange them on your baking sheet (not touching) and freeze until the biscuits are solid. You can then transfer the frozen biscuits to a resealable plastic freezer bag until needed. There is no need to thaw them out when you want to bake. Just place them back on a parchment lined baking sheet, preheat your oven and continue with the recipe as usual. They'll rise and everything just as if you'd made them fresh, which is really nice because it's so much easier to have the messy steps out of the way when you're baking for company. Before baking, I like to brush my biscuits with some melted butter. 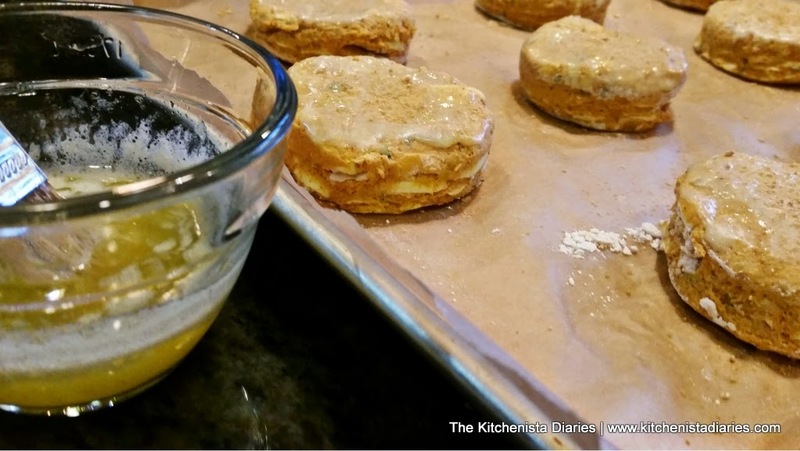 If your biscuits were frozen the butter will firm up immediately, but that's just fine. Bake at 450 for about 15 minutes, until the biscuits have risen and started to crust around the bottoms and edges. Don't open the oven door while they're baking or too much heat will escape; just use the oven light to keep an eye on them! 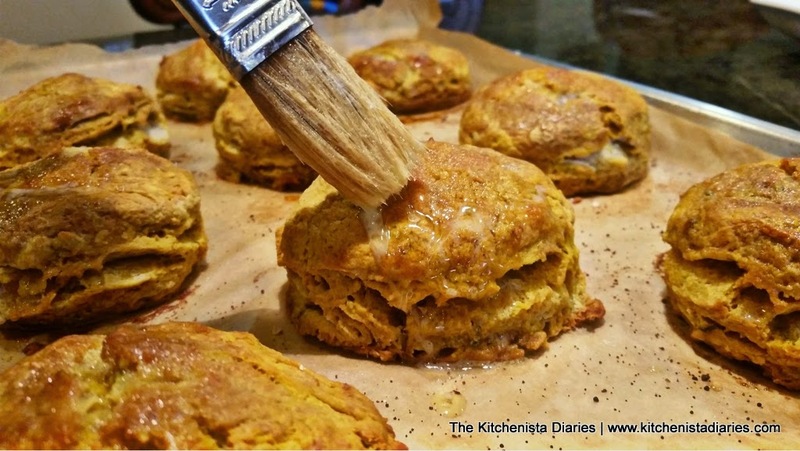 I always loved a little bit of honey and butter on my biscuits, but for pumpkin sage biscuits? Pure maple syrup is the perfect touch. Enjoy!! Looking for another version? 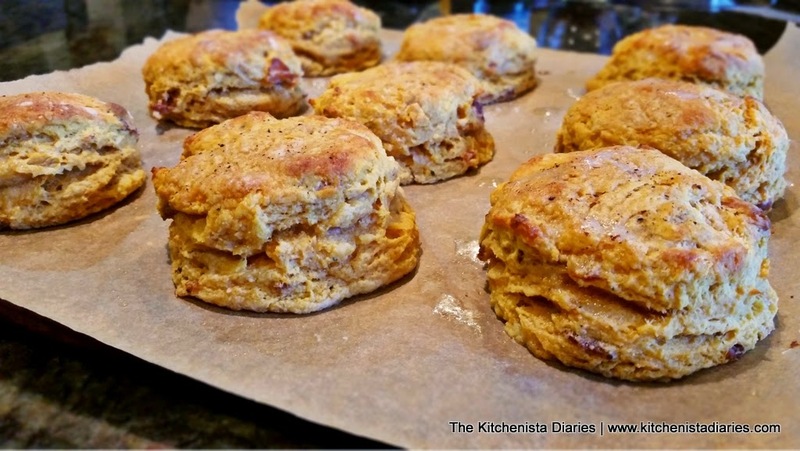 My Bacon Sweet Potato Biscuits recipe is still available with a small donation to help keep The Kitchenista Diaries going. As always, thank you for the tremendous support I've received here that has helped me to work towards my dreams!